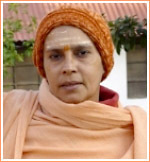 Yoga sadhana is a collective name for all yoga techniques which are deliberately adopted to remove the imperfections of the personality. The disciplinary exercises of yoga are meant to condition the mind, the intellect, the emotions and the body. Through yoga sadhana one acquires equanimity, serenity, one-pointedness of mind and strong determination. One also regains one’s lost confidence. All these qualities are essential for successful living in all spheres of life.